1. Board and Wards (B&W), by Ayala and Spellberg – This was the main book I used. It was easy to read and not too dense. It is higher yield than First Aid. Read this book 5-6 times before the test and memorize everything in this book. It will help tremendously. 3. 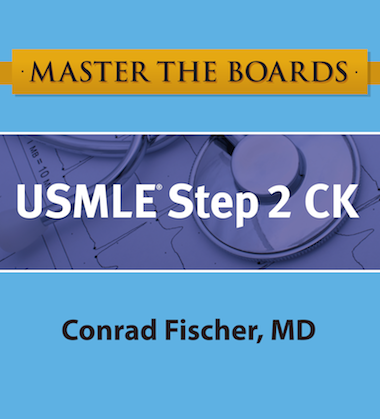 Crush Step 2: The Ultimate USMLE Step 2 Review, OR USMLE Step 2 Secrets, both books by Adam Brochert—these books are very helpful. They pretty much cover the exact same content, in different formats, although Secrets is slightly more detailed. Therefore, getting either one will suffice. However, if you happen to have both, by all means, use both. It will be similar to reading the same textbook twice, but in different forms, which is better because you are asked on the test to be able to apply what you know in various ways. So it helps to learn things from not one, but many perspectives. 4. Kaplan notes—these are pretty good, actually, but don’t rely on them. Read them very fast to get a good overview and understanding of the material. They are expensive. 5. UCVs—as for Step 1, UCVs are great for familiarising yourself with key medical conditions and buzzwords. Clinical vignettes are even more important for Step 2 than for Step 1. 6. For specific subjects, i.e. Medicine, Surgery, Ob/Gyn, Pediatrics, Psychiatry, just try to get the highest rated review books listed in the back of First Aid. If two review books have the same rating, just use the one you have, or can obtain at a cheaper price, or you like better. For Medicine, I used Step-Up and High-Yield. For Surgery, I used NMS Surgery Casebook. For Ob/Gyn, Peds, and Psych, you can use Blueprints. 1. You’ll need to practice a lot of questions under exam conditions to get comfortable. The best rated Q Bank is USMLE World (the one I used). I think it’s excellent. Make sure to do them under exam conditions—i.e. timed, random blocks of 46 (or is it 44 now??) Q’s at a time, just like the real test. 2. Get the practice questions from the official USMLE Website here: http://usmle.org/practice-materials/index.html Also ready everything on the website about the Step 2. These questions are free and are as close to the actual test as you can possibly get. So do them closer to your test date to see whether you are ready or not. 3. NMS Review for USMLE Step 2 is also a great question source. I think the older edition is better (and you can get it for much cheaper too).